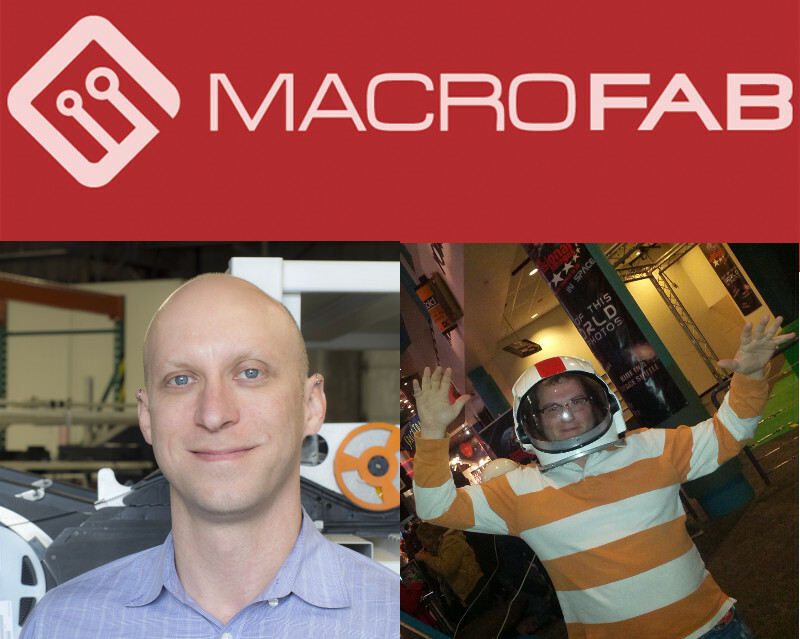 Welcome Chris Church and Parker Dillmann of Macrofab! Macrofab is a new contract manufacturing service to allow for low cost single or multi board runs using a very friendly UI interface. The facility is in downtown Houston. There is a brewery next door and the Houston MLS team plays down the street. Someday they would like to bring PCB manufacturing in house so that they can get a 24hr turn on assembled boards. They recently announced that a 5 day turn is available. Macrofab has raised 2 angel rounds, one in fall of 2013 and one in mid 2014. Listeners should try out the service using the demo link that shows the price of a propeller dev stick board. A big way of lowering costs is having users verify rotation and alignment of the parts from the placement files (derived from the uploaded EAGLE, KiCad or DIPtrace files. Another way of keeping costs down is using the house parts. The labor is free on all of those parts. There is currently only a part library for EAGLE, others coming later. Macrofab has a Universal GSM2 pick and place, built in the mid 2000s. It can do 0402 parts, up to 6000 parts per hour. There are 32 feeders per side plus platform tray of 28. Reflow is the long time sink for a lot of boards. They can also do selective solder for through hole parts. There are 4 full time employees at Macrofab plus a range of part time line workers. For the low quantity boards, a lot is placed by hand. Each part received after being bought is also recorded for lot control. Programming firmware is done in house, but is disabled even though it’s shown in the UI. Currently the UI can do 2 layer but 4 layer is coming soon. The low quantity boards are done by OSHpark and bundled or higher quantity boards are ordered as panels from Korea. Solderpaste is done with kapton (for low quantity) and stainless stencils (for higher quantity). Parker wants to get a solderpaste printer. They want to solve the problem of providing enclosures by the end of this year. Chris and Chris are both fans of the schematic as a control document. This requires revision control and only making changes in the schematic (the “canonical representation”). The Macrofab group focuses on API “microservices” and a strong UI with a lot of tool tips (mouseovers) to help explain the different features. It was great hearing about the future of getting boards made from the Macrofab guys! We hope to talk to them as they keep expanding! All the best of luck to Macrofab! From what I’ve heard on the show, your system is pretty sweet! Thanks for taking the time and coming to the show! Took a glance at Macrofab’s website. From what I’ve seen, their platform and UI looks rather solid. Best of luck to Chris and Parker in all our their endeavours. I don’t know Mr Church personally but we mingled online when he cofounded his previous “niche electronics consumer product” business. It was an impressive spectable. He always struck me as the sort of person who had his finger firmly on the pulse of the community, whilst also possessing the technical chops to actually make serious stuff happen. No doubt, if there’s mileage in this business concept, these guys will make it work. While perhaps it’s expanding too fast, the idea that they can someday offer an end-to-end solution (including enclosure design) puts them way ahead of the circuithub/snapeda players and more in competition with the Dragon Innovation style companies! Very cool. I look forward to the day when I can sell my projects on your site – anyone that wants one can order it and you make it for them – like some of the 3d printing sites do now.